From a quite sad situation arose the opportunity to see how much LSG Sky Chefs employees in Guarulhos, São Paulo, are willing to give a piece of themselves to help many others. 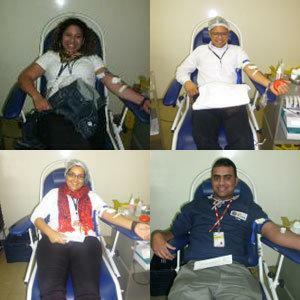 It all started when a relative of one of our colleagues in the Brazil team was in hospital and in need of blood. The first call for help was a simple e-mail and the response was amazing: 30 employees were quickly mobilized and went straight to the hospital to help! Touched by the idea, a local bus company gave free transportation to and from the hospital to the willing donors. In the following days, blood donation was a hot topic in the office and many other colleagues showed an interest in donating to those in need, but unfortunately had no time or transportation to do so. This is when the local Bonded Area Manager, Robson Sá, together with his General Manager, came up with the idea of bringing a blood bank institute to LSG Sky Chefs in Guarulhos. On August 7, 2014, a team from Banco de Sangue Paulista brought all the necessary equipment to set up a blood donation area at the unit. The number of donors was again much higher than they expected: in just one day, 60 employees donated blood to the institute. Marcela Langhi, from Banco de Sangue Paulista’s marketing team, sent me an official letter saying that “The campaign was a success! We had 60 donations, which helped 150 patients; saving their lives (…) We are extremely grateful to LSG Sky Chefs for this action that demonstrates the relevance and social commitment of this company to our society”. LSG Sky Chefs Guarulhos General Manager, Mauricio Novaes, thanked and congratulated all the participants and expressed his desire to continue engaging in such campaigns: “Knowing the importance of participating in the social life of our community, we will continue to endorse and incentivize the participation of our employees and partners in social responsibility campaigns”. If you want to know more about Banco de Sangue Paulista’s, please visit their website.